Commentary: In Rogue One, Director Krennic is under Tarkin and Vader but seemingly above pretty much everybody else. His outfit looks a bit like that of Yularen, with a cape - and capes aren't super common in Star Wars. 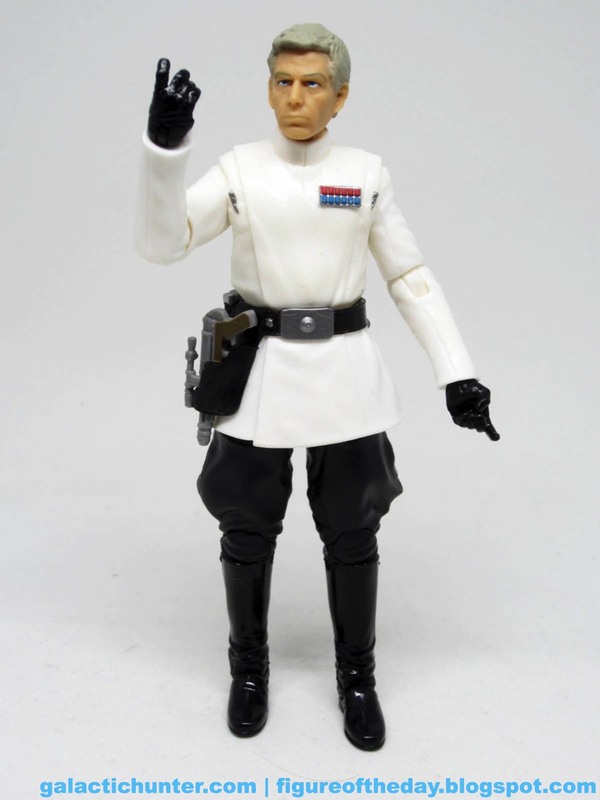 I'm not sure why he has one - I mean, Tarkin doesn't. But Lando does... and so does Tessek. Are they chilly? Is it to help keep the white uniform clean? Is it just because it looks cool? I have no idea. This is the first "Imperial Officer"-type figure in this line, and I hope it means the door is open for Tarkin or at least one more at some point in the neat future. The traditional tunic, boots, and gloves are all here as is a new blaster which fits nicely in the new holster. Unlike most Imperials, Krennic actually uses his blaster in the movie - I can rarely picture a major officer ever actually shooting somebody or even having a weapon on which to draw. Everything basically looks right - he's got a grey gun, black gloves, shiny black boots, a silver belt buckle, and a little bit of snow on his hair. He could stand to have more. The skin tone is better than a lot of other human figures as of late, as the flesh looks a little less waxy than some. With over 25 points of articulation, I've not yet tried his waist joint - I've been advised it's a little fragile, so I don't much feel like risking it. The cape covers the figure nicely, and renders the articulation mostly moot - it's nice to have double-jointed knees, but will you ever actually use them given that the skirt of his tunic restricts movement? Probably not. The extra parts here add cost, and while functionality is built-in it's not particularly useful or aesthetically pleasing. 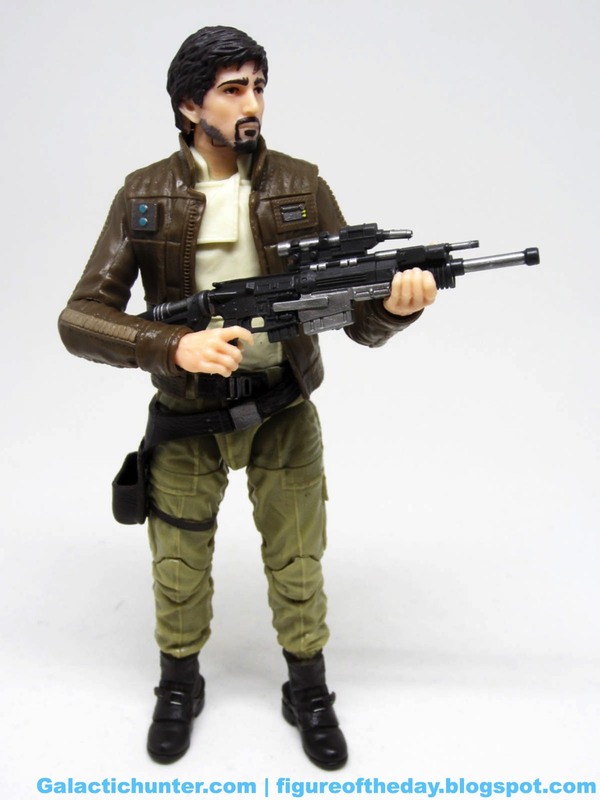 We're getting to a point where Hasbro could probably cut costs by running a secondary assortment of figures that don't need to be fully posed, maybe statues from the waist down that could bring down the prices significantly. I wouldn't be too upset if they had a discount wave, not unlike the Big Lots!/Family Dollar/Dollar General figures when less "action" is called for. 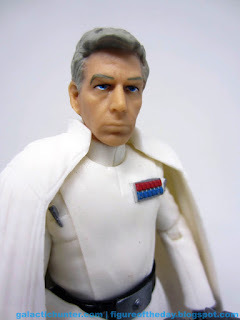 With the abundant articulation, good head sculpt, and expressive fingers, Krennic's a figure that any Imperial fan is going to want. Commentary: As I've mentioned before, I was both disappointed and inspired when I saw a plain white Phase II Revenge of the Sith armored warrior. On one hand, it was boring - but that also meant that the 501st Legion Clone Trooper couldn't be far behind... or so I thought. It turned out there were no plans for it in the immediate future, so here it is! 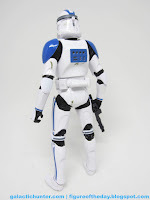 Because it's a trooper and a clone, Hasbro used the same body and helmet for five figures to date - the big changes are deco, and boy howdy are they some big changes. The pure white figure has been gifted a generous slathering of blast damage and blue rank marks. 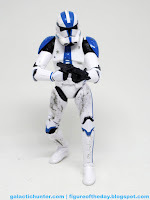 Hasbro delivered a figure that's surplus to requirements, with molded blue shoulder pads that seem to match the painted stripes on his helmet, legs, arms, and torso perfectly. Rather than just give you a plain version of the trooper, Hasbro pulled out all the stops to damage and scratch him up at the factory. The blue paint masks are peppered with small holes and scrapes, allowing white plastic to shine through the squadron markings. 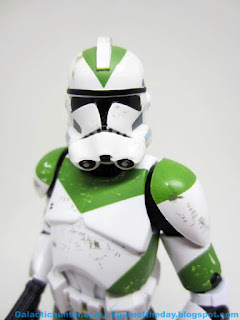 On the shoulder pads, white and grey paint were added to give the illusion of battle-worn acts of (I assume) heroism. The helmet has a few scrapes on the front and back, while the arms and torso are almost clean - just a few scrapes. The legs are amazing, with black streaks and smudges indicating that this warrior has seen some serious action. What's more, the back of the figure has a panel that has been decorated blue as well. The soles of his boots appear to be plain white, but if you're going to leave off a paint application that would be it. The black gloves, the blue wrist stripes, the grey stripe on the back of the helmet, they're all here. 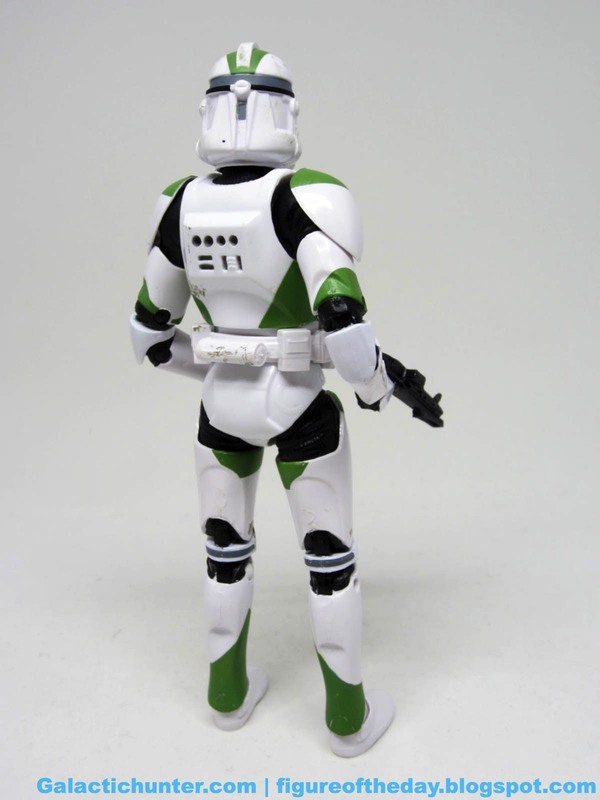 Articulation is exactly as good as the other clones, because they're all the same body - it's good. Even though this is an exclusive at my place of employ, I almost wish we sold it individually so we could troop-build with it. Alas, business reasons happen and it's a four-pack. I'm glad to say all four figures are made with this much care, so if you feel like raising a few armies it's a snap to do so. 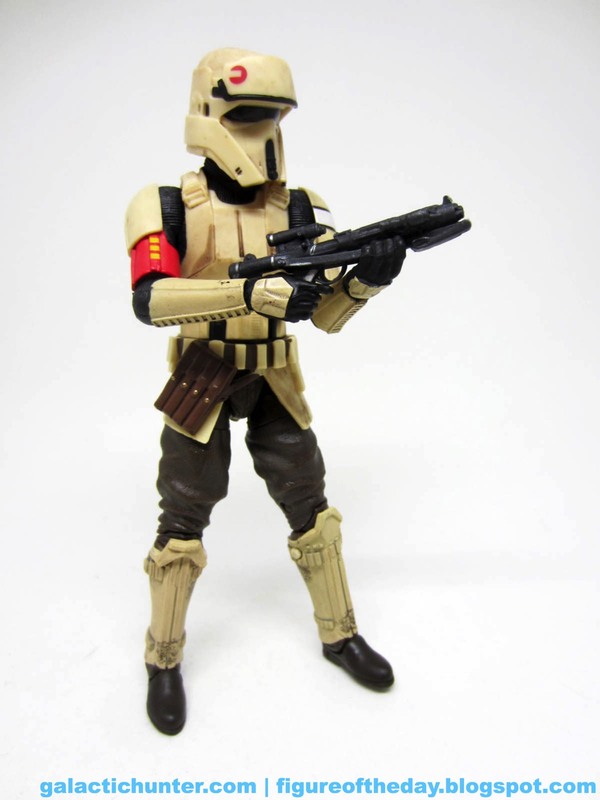 My biased comment is that this is the one I most wanted and I'd say it's the second best trooper in the set. If opportunity and finances favor you, go ahead and get this set for this figure. And get extras. You've got an Anakin that needs an army, right? Collector's Notes: I got mine from Entertainment Earth. Where I ram-rodded its creation. Commentary: Ever since the line stared, fans asked "Where is C-3PO?" We got R2-D2 in 2013, and two versions of C-3PO in 2016 - and I'm sure Hasbro is considering more R2-D2 variants to make up for the last few years. 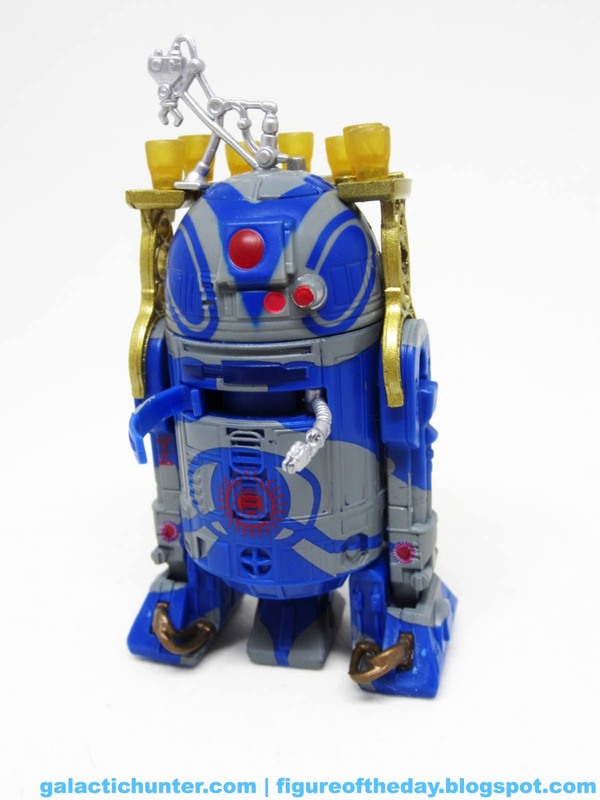 Fans were hoping for a vac-metal gold figure, which Hasbro carefully managed our expectations to say it wouldn't happen. They didn't mention that the figure wouldn't have accessories or elbow joints, and that's sort of a bummer. I'm kind of amazed to see myself say that a figure like this - with 23 points of articulation - is something of a disappointment of articulation, but here we are. C-3PO looks like C-3PO. 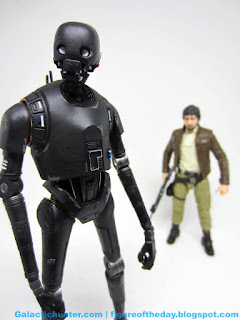 Two versions of this The Force Awakens figure - first previewed nearly a year before his release - exist, one has a lighter red arm (seen here) and the other one has a darker red arm. Nobody knows which is more common yet, but I've seen more of the dark red one in the wild. The figure is a metallic gold paint, but it isn't reflective. Sometimes - not always - this paint can age poorly, gooping up years later and discoloring. There's really no way to know for sure if this will happen until it does, and I've seen it on very few Hasbro C-3PO products so far. This generous paint slathering may be where the figure's budget went - it doesn't have rotating knees or bending elbows, or an accessory, but it's very pretty. The eyes have dots to indicate lights, the belly has painted color wires, his palms are partially painted black, and.... that's pretty much it. 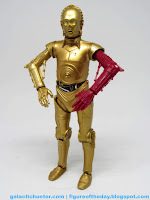 C-3PO has been and probably always will be a pretty simple figure. With the bar joining his upper and lower arms, the elbows are fused by design - so Hasbro had a choice between making an expensive and potentially fragile mechanism, or leaving this element off completely, or just fusing it. They fused it. The knees can go forward and backward only, yet the figure was mercifully given rocker ankles. You should have zero problems making C-3PO look good in your dioramas, but I can't imagine it's going to be in any action fighting poses. This wave started hitting hard in my area in December, which is nice to finally see. C-3PO has historically been scarce at first, and then sits. Forever. So hopefully you'll see this one, or the all-gold Walgreens version, in the very near future if you haven't yet bought one. I assume a redeco or three are coming, as we've got three variations so far, so you can take your pick. 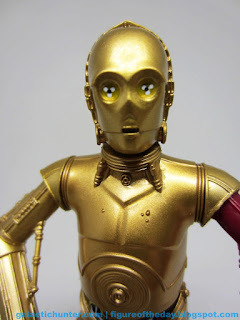 The sculpt is good, the deco is good, and it's clearly C-3PO and capable of assuming protocol droid poses. At the same time, if they did a C-3PO in Hasbro's cheaper 6-inch figure line, you'd probably enjoy that one about as much at 70% cheaper. Commentary: Since the prequels fans have asked "Now how come the Empire didn't have more color in its army?" The Scarif Stormtrooper shows us that they did, but when they went to the beach with the soft drinks and candy, someone blew them all up. I find that reasoning a little hard to swallow, because a) I don't doubt that armor and clothing is manufactured and stored off-world, and b) I snapped some scar tissue in my jaw and after the dreadful internal explosion, holy cow this is killing me. But I digress. For reasons only Hasbro understands, the basic Shoretrooper was made as a Walmart exclusive. The Squad Leader is in the main line. And don't worry, you're unlikely to actually easily find either for at least a few weeks to months thanks to the new movie release and the legions of people out and about buying Christmas presents for fans and non-fans alike. 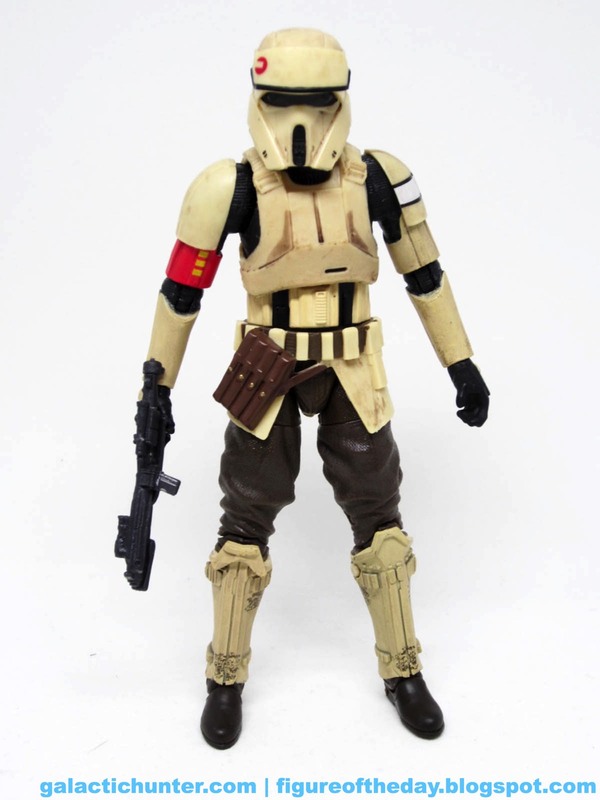 This isn't a bad figure - it's not as cool as the Squad Leader because it's less colorful, but I like it. The figure is molded in a great sandy brown color and is enhanced with dark brown pants and shoes, a black body glove, and some red on his shoulder with three yellow dots that no doubt signify rank or how many drinks it takes until this guy passes out and someone puts his hand in warm water. 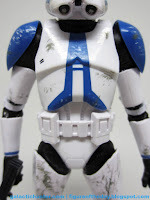 The figure is peppered with weathering and swell details, like vents on his helmet and backpack plus a white band on his shoulder. Again, I don't know why it's here, perhaps it's the color his underpants were prior to the warm water hand dip. A little red symbol on a forehead ornament looks great, as do the various pouches and buttons on his belt. Articulation is better than expected, as Hasbro gave the elbows a little more clearance so he can hold his new blaster in fancy positions. It looks like a standard Stormtrooper gun, but it has that added little scope thing on the sides. The blaster deco is also some of Hasbro's finest, with silver highlights/battle damage highlighting the various grooves, tabs, recesses, and embossed bits. 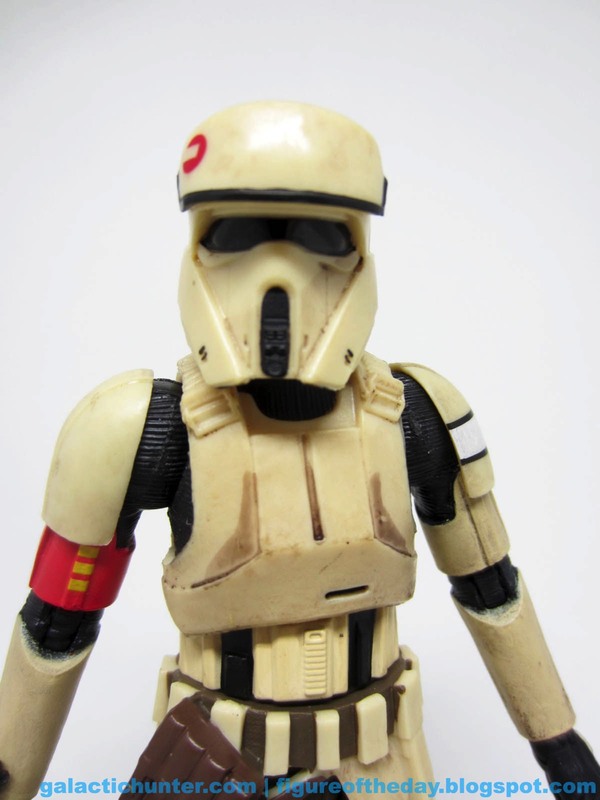 It's cool - you'll be angry they didn't remake the regular Stormtrooper with one. 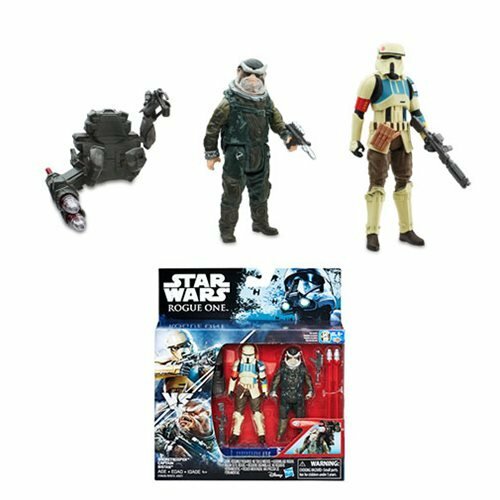 Our new friend here shares a lot of parts with the Hovertank Pilot (Toys R Us exclusive) and the aforementioned Scarif Stormtrooper Squad Leader. Those two each have unique belts too, plus very distinctive deco and in the Pilot's case, a unique helmet. They're all great, but if you want to make the best impression on your desk with one figure go ahead and get that Squad Leader. 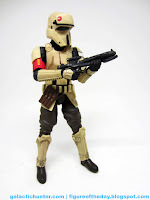 If you see the regular shoretrooper, it's pretty fantastic - I would army build these guys if I did such things with the bigger, more expensive figures. Instead I'll have to settle for not army building the 3 3/4-inch line, which is also too expensive and I can't find them en masse anyway so who cares? Get this figure if you can see it. 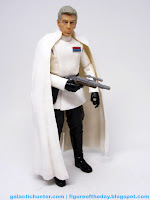 The figure looks like a great post-Return of the Jedi design, despite being a pre-Star Wars design in some respects. It's more at home with the kind of things I like. Collector's Notes: I got mine from Walmart. The store had about a dozen one day and zero the next, which is the way of the Force I guess. 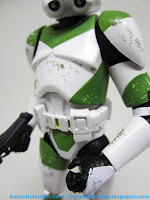 Commentary: There are a lot of Clone Trooper figures, but not all that many as 6-inch action figures. 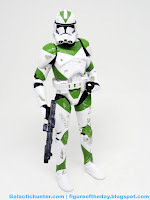 The 442nd Siege Battalion (green trooper) was one that had a few very vocal fans, and that's why he appeared in this set - it helps to lobby for the things you love, because you never know who's listening. 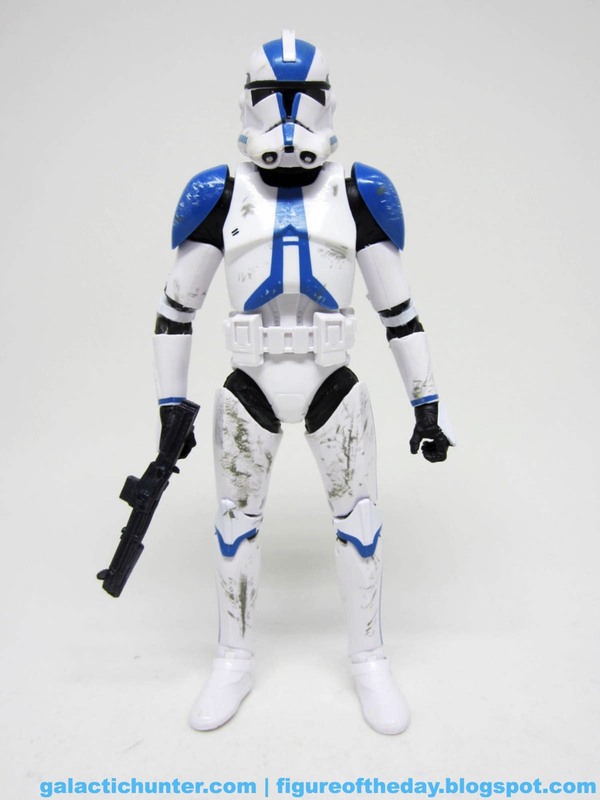 The figure is the same as the one Amazon sold as a plain white trooper in its 2015 exclusive set, but with a twist - well, not so much "a twist" as "something to make it good." 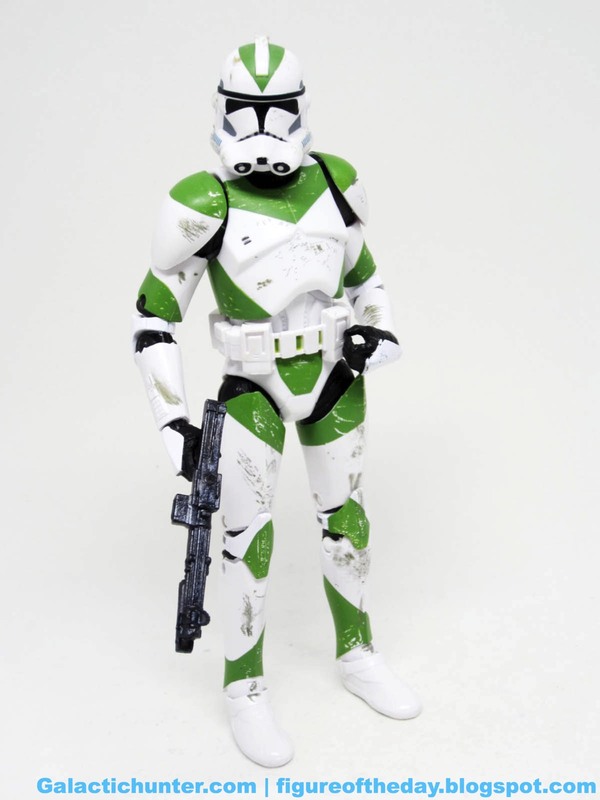 The plain white Phase II Clone Trooper was as plain as they came, and for this go-round Hasbro decided to really ramp up the deco. Like... I can't believe how ramped up it is. You've seen the body before, so the 29 points of articulation are unlikely to surprise you - rocker ankles, bend-and-swivel wrists, things that once would knock us flat on our butts are now de rigueur. 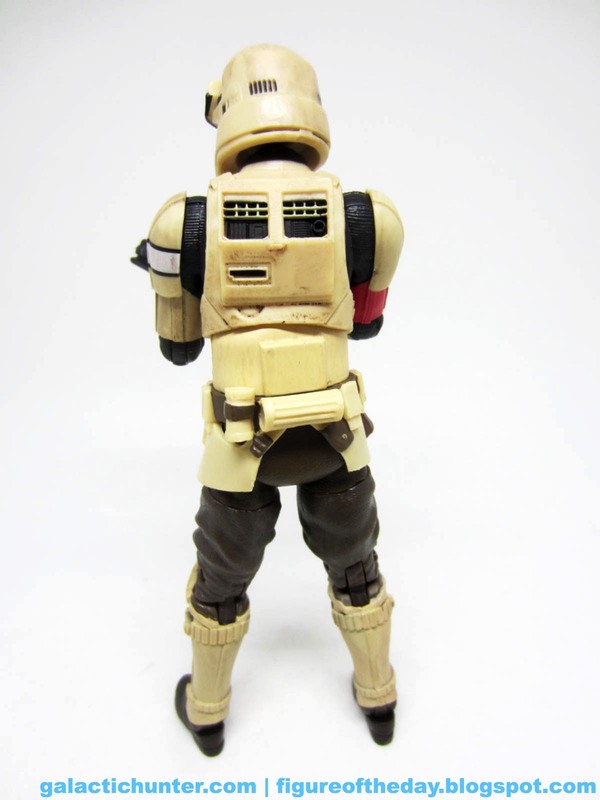 Double-jointed elbows and knees are a holdover from an early phase in The Black Series, as Hasbro has elected to keep the knees but drop the elbows on most of its figures since late 2015. Mercifully as a mere redeco, this figure keeps the great jointing. Despite being trimmed from the film or merely a concept for Revenge of the Sith, the green clone is no slouch. 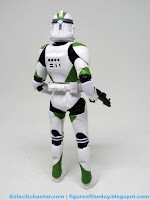 It shares a basic design template with Utapau's orange clones, but shockingly isn't just a color swap of the 212th Attack Battalion clone in this very set. The battle damage and scrapings are totally different! I'm stunned! I've also gone on the record as saying that the prototypes for these figures had some of Hasbro's best paint jobs ever - and I'm thrilled to say the final figures are just as good. If you look really close, you'll notice that the green squad markings are actually scratched up. The little white specks in the green fields aren't white paint bits, they're actual exposed bits of white plastic. This sort of thing is kind of uncommon, so you best believe I'm in luv l-u-v. Each green marking is scraped and scratched, but I should note that the left shoulder and the top of the helmet are pretty clean. That doesn't mean you can't mess 'em up with a rock or something. Expensive exclusive sets are probably about to become a thing of the past - Hasbro's 2015 bit TIE Fighter and Millennium Falcon got marked down pretty severely. 2016's higher-end Transformers have shown up in the markdown channels pretty quickly. The sad reality here is that if you don't support sets like this, there won't be more. Maybe you care, maybe you don't, but there's certainly decreasing incentive for these sorts of items to be produced in the current marketplace and retail climate. 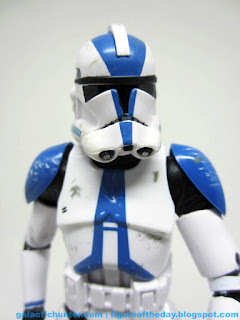 I hope we see more - there are certainly more Clones I'd love to see from The Clone Wars and beyond - but it's starting to feel like this might be the last/only hurrah for Revenge of the Sith in the 6-inch size. Hopefully before Hasbro calls it a day, we'll at least get Count Dooku and maybe a swell General Grievous. I like this clone a lot, and I think if you saw it up close you'd love it too. I should also note that the box is not unlike a VHS tape boxed set - and as a bonus, it's not taped shut, so you can slip the figures back in if you're so inclined. Collector's Notes: I got mine from Entertainment Earth. Where I ram-rodded its creation. There's an interesting creation story behind this set I hope to someday share with you. Commentary: Good, bad, he's a guy with a gun. The unusually tall Death Trooper squad was played up to be the baddest of the bad. What we saw on screen wasn't quite as amazing as what we got out of our Clone Troopers, even in Revenge of the Sith their quick presence was pretty awesome - seeing what they'd do in a few shots made them seem incredible. The Death Troopers start out as these evil-looking faceless agents of death, but really all they do is gun down a terrified woman and act as bodyguards for a petty bureaucrat. Sure, they have some secret twin language, and yeah, the armor's cool - but like so many nifty characters before them the sum total of their coolness could be felt prior to seeing the actual movie. It's a neat design I have no doubt will become a comic convention staple in no time, but unless they make more appearances and do more cool stuff I don't think a lot of people will be pining for their return. Thankfully, the figure is pretty good. A Special Ops commander variant with more gear was sold at Target, but the basic one is pretty nice. Like the smaller figure, you'll notice much of the armor is similar to that of a basic Stormtrooper. It's not identical, though - new grooves and lines set it apart, with new knees and distinctive shoes. The pouches on the belt add a little flair to the design, and the rangefinder on the helmet is a nice touch. For some reason they even share Darth Vader's belt buckle despite not being associated with the man on the big screen. 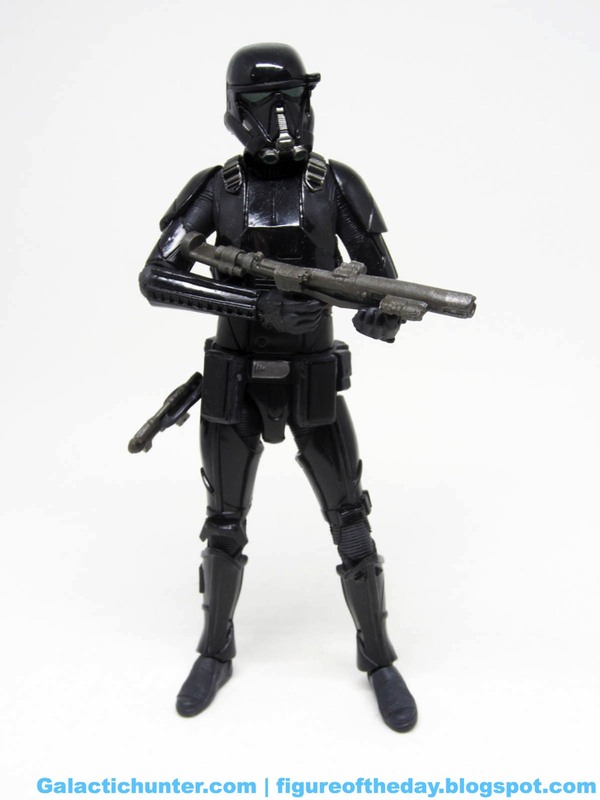 Articulation is good - he can hold the rifle in both hands which come complete with bend-and-swivel wrists. The ankles rotate nicely, complimented by double knee joints. 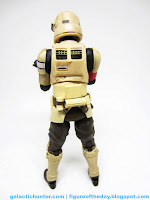 For some reason Hasbro has decided the double elbows are no longer necessary, so the classic bend-and-swivel articulation remains to be as good or as bad as you see it. The black plastic is glossy and shines nicely, with dark green - sadly not bright light green - lights around the chin. 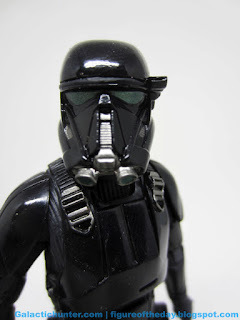 The lenses of the helmet are also green, with some silver accents on the figure. 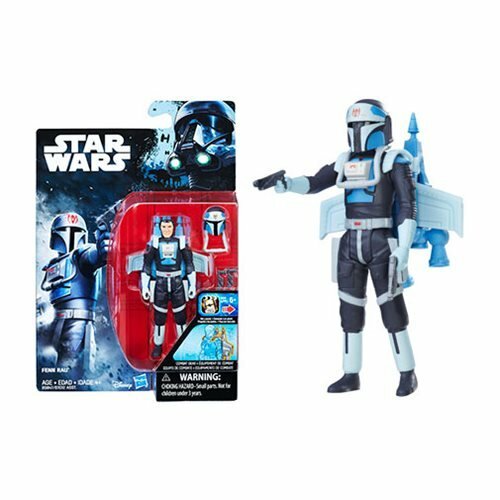 Hasbro did a good job translating the design to an action figure, complete with a li'l holster to carry the smaller blaster pistol. This is a figure that delivers on the promise of a good trooper - it's close to great, but not perfect, and comes across as a good figure for the price. I hope you got as many as you wanted, as they seem to be drying up quickly. Get one - or five - if you can and are so inclined. I'm not troop building this scale, but it's a pretty good figure. It doesn't innovate much - Hasbro has a good template for its troopers and they should be commended for sticking with it - so buy one if your budget allows. Commentary: Hasbro can't seem to get hispanic dudes right. Humans in general seem to be tough to nail, especially when Hasbro's factory pick a wonky plastic for the skin tone and iffy facial hair paint. The outfit, pose, articulation, and gear for Captain Cassian Andor are great, but the head isn't as Diego Luna-tastic as you might want. He looks like any of a number of other people, but not quite this guy. In terms of the costume, it's pretty good. You get a nice jacket, a nice pair of pants, and a decent shirt. He has no problem holding his gun, which is handy - even with the clip-on sniper's gear, he can still hold it in both hands. The figure's range of motion with 27 joints, although some are a little stiff. The bend-and-swivel wrists are somewhat blocked by the jacket, as is his neck. The way the jacket piping lines up is a little funky, but it basically works out pretty well. It feels like a dry run for a Bespin Han Solo figure, complete with working holster. I dislike the head. 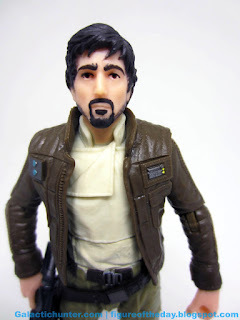 It looks like the sculpt might actually be pretty good, but the iffy plastic, terrible facial hair, and not as good as they could be eyes bring it down. The actor is my age and vaguely adorable - just like me - with a little bit of scruff, a mustache, and a soul patch. The figure seems to have a goatee and really bad chin line scruff which is unpainted in spots. 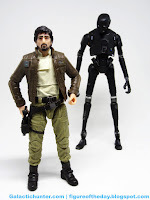 I don't think they've quite mastered that look yet - look at all the Poe figures - but it comes off better as a 3 3/4-inch figure than as a 6-inch figure. Even the Eadu version looks a bit better than this, but it's still not perfect. I expect customizers will prove that better paint would have saved this, and/or someone will start cranking out bootleg Diego Luna replacement heads. It's sort of frustrating that Hasbro's human heads are all over the map, and in this era of 3D-scanned likenesses the last mile at the factory is giving us product that just isn't great. It's not terrible - but it's just kind of frustratingly sub-par. It's clearly a well-designed figure, executed poorly where it counts the most. I could live with less articulation if this figure looked perfect. 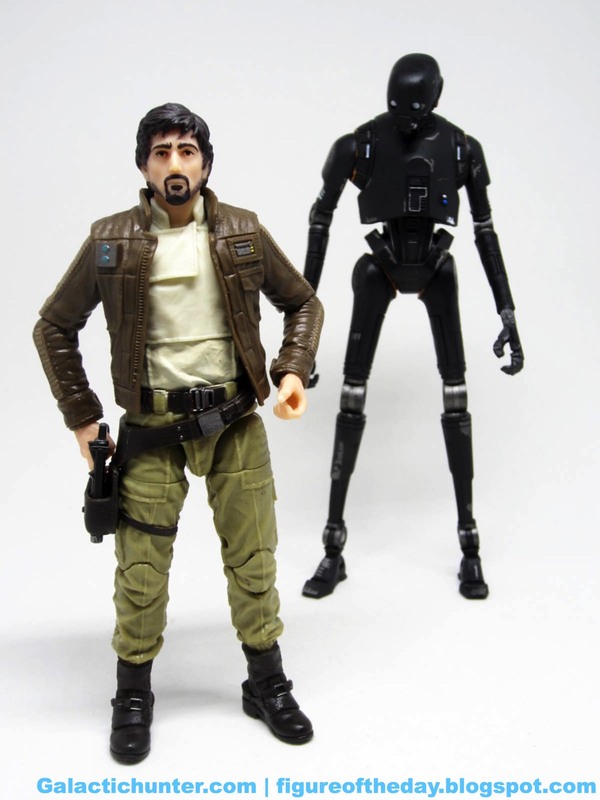 As part of a 3-pack which infuriatingly includes another identical Jyn Erso (also sold at SDCC, also individually) it's unfortunate that we were asked to pay a $20 tax just to get this Cassian Andor and another, more special Death Trooper. I do not anticipate more or better versions of this character as an action figure, so I'd say get one when the price is right and hope someone can improve the head for you. If it's you who improves it, even better. Commentary: And we're back for a bit! The very tall much-needed comic relief is here, in 6-inch plastic form! 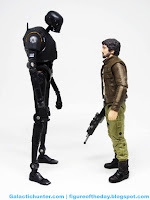 K-2SO is one of the tallest - if not tallest - droids this line may ever see. It has loads of articulation and, surprisingly, can remain standing upright so far. Given the thin legs and bulky body I can't assume this will last forever, but hey - maybe! Worst case scenario, we all need to go buy a bunch of doll stands. I should also note that this toy does not include a blaster - early samples used in photography show a gun, but the Alan Tudyk robot has no hand weapon. Arguably the bright spot of the new movie, K-2SO continues the long tradition of droids in Star Wars being more human than their flesh-and-blood counterparts. In the mold of the likes of HK-47, C-3PO, and PROXY, this particular droid is reformatted Empire military hardware with a few problems - hence the interesting personality. It's a bug, not a feature, and there are multiples of these guys in service that look almost the same. As such, you could probably use these in your various dioramas since there are no real official playsets being made for anything right now. The figure is a good one, loaded with articulation and brilliant design cheats. The elbows, knees, and ankles are open circles in the movie - but that leads to stability problems, so instead Hasbro employed clear plastic filler in there to look like it's clear. Hasbro is usually good at making decisions to keep figures stable, but clear plastic for joints can be problematic. (See: DC Collectibles' Batman: The Animated Series, some Funko Legacy figures, some Transformers.) Since it's PVC, I assume the worst that will happen is some yellowing after exposure to light and/or time. But for now, at least, it looks good. The black metal body is great, with "exposed" damage marks showing the silvery metal underneath and orange on some of the joints. 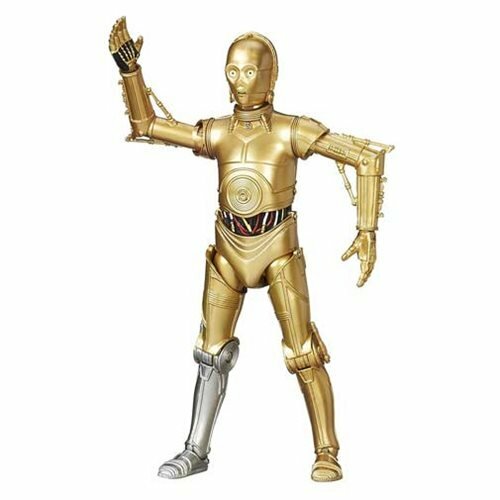 29 points of articulation keep this droid alive, allowing you bend-and-swivel wrists and numerous other joints all over his body. 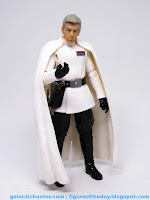 Interestingly, the figure has a smell very similar to my childhood Empire Strikes Back-era Darth Vader - I wonder if they used a similar plastic? The character looks pretty good as there's no human head to replicate, so it's appropriately droid-ey. You get the Imperial logos, you get the silver joints, it's a big robot with the Stormtrooper-esque "OII" on his back with a little antenna duo. 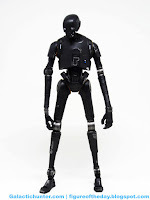 The design reminds me a lot of the EV-9D9-esque droid from Return of the Jedi that shows up in some of the archive books - no toy was ever made, but it's big and tall and black. It's consistent with the Empire's general ethos. Despite the lack of accessories, I like this figure. A big droid with tons of articulation meets my needs for base level awesomeness, and I assume this is/was/will be the favorite character from the movie for a lot of people. Get this one for now, I don't expect figures from this movie to be a regular thing down the road. Commentary: I liked this one. 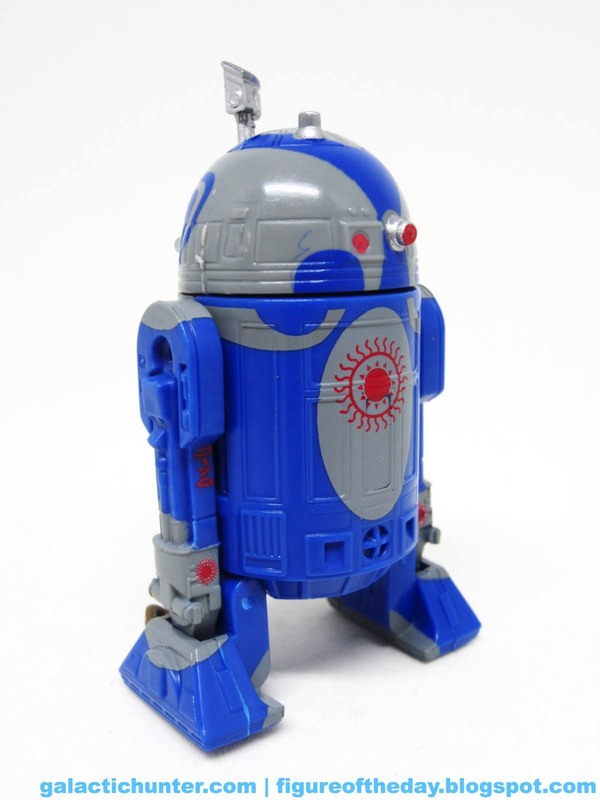 Along with Jabba's Bartender, R2-C2 was a robot I just had to have. 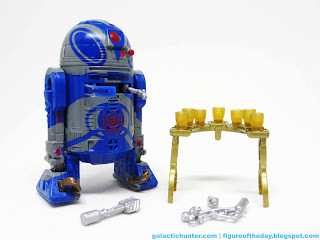 Part of the reason was that it shared a mold with another bartender droid - why settle for one when you can have two for twice the price, right? There was some weirdness with the name (which I believe was RC-C2 on some paperwork) so there were more than a few references to RC Cola in the marketing. (Also, I like RC Cola.) This droid was in The Clone Wars movie as one of Ziro's stooges - and one of the most nifty examples of coloring outside the lines you've ever seen. I loved the idea so much because it's the kind of designer thing I've been wanting to see for years - I was hoping to put out blank white astromechs as an exclusive in the '00s but such a thing was "against the spirit of the brand" at the time. Oh well. At least we're getting some fancy weird designer droids now under Disney, although I'd say Ziro's drink dispenser out-weirds them all. Hasbro did a great job translating the animated design to the "realistic" style of the movies. Ziro the Hutt doesn't yet exist as a figure, but if and when he does get to see plastic at least you've got a few of his robots ready to go. The figure is about half grey and half blue, liberally covered in an even, thick coat of grey. Red spot color brings him to life with eyes, projectors, and of course Black Sun tattoos! I believe this may well be the first (or only) astromech droid to feature any sort of faction markings in the world of toys. Considering how partisan a lot of the hardware looks in Star Wars, it's kind of surprising more robots aren't marked with the political leanings of their owners. Each glass is completely removable and the figure is outfitted with an opening chest compartment with a flip-out arm. The compartment's ability to close seems to vary from sample to sample, so you may need to do some customizing to get it to fully close. Or if it's closed when you get it, go ahead and leave it that way. It was my hope that this droid set would be ultimate 2016 buy for the pre-Disney-era fan who has everything, although there were numerous challenges when it comes to making something for everybody. I hope you like the set, and I also hope Hasbro has more up their collective sleeve for additional super-articulated exclusive figures and figure sets from the original six movies and older television shows. It's still a rich universe with lots of amazing stuff - and I hope the dollars make sense enough to continue to wallow around the alleys of Coruscant and the palaces of strange far-off worlds. And if they don't go there, well, we got Ziro's custom robot drinking buddy. We'll always have that. Can you think of a better eggnog delivery mechanism? Collector's Notes: I got mine from Entertainment Earth, where it is an exclusive. I work there and was heavily involved with this exclusive... so please do buy a set. Also, I need a break! We'll be back after I see the movie.